This week’s pick is Pocket, the excellent read it later app that actually used to be called Read It Later. Pocket and Instapaper have been the two leaders in this area for a long while now, and deservedly so. There are a number of reasons to save articles to Pocket – for example when you skim an item and want to read it in full later on, or when a piece is so good that you want to keep it to read again and refer back to as needed. Pocket keeps all your save items available, even when you’re device is n ot connected to the web. — It lets you save normal text-based articles and also videos – and offers separate sections for All Items, Articles, Videos, and Images. — It has a simple and attractive UI that makes it easy to browse through your content. It offers dark and light themes and a nice range of options to get the app working just the way you like. — It syncs automatically between the iPad and a good Mac app. It’s also cross-platform and works well on Android devices too. — It’s heavily supported by other apps, so it’s easy to save things to Pocket from just about anywhere – with a Save button in a browser, or via Sharing buttons from within numerous 3rd party iOS apps. 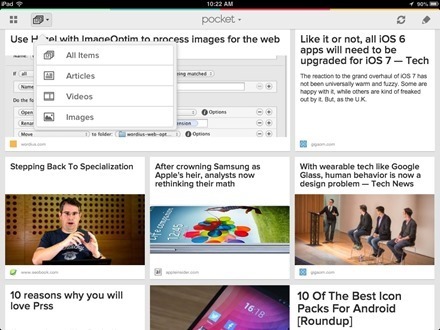 More than 300 apps share to Pocket – including Flipboard, Twitter, Reeder, Zite, and Feedly. Here’s an App Store link for Pocket for iPad.